Here at Hume, we know everyone has different styles and preferences, which is why we have such an extensive range of door options. We’ve recently added even more and now have our Barn Door range. Whether you’re using raw textures and colours to contrast the warmth of the indoors to the ruggedness of the outdoors, or you’ve picked the door because of its grandness, or even just because you like the homey feel the product gives off, the doors in this range are sure to make the perfect feature for your home. In addition, these doors are great space savers, as they follow a similar principal to our cavity slider. 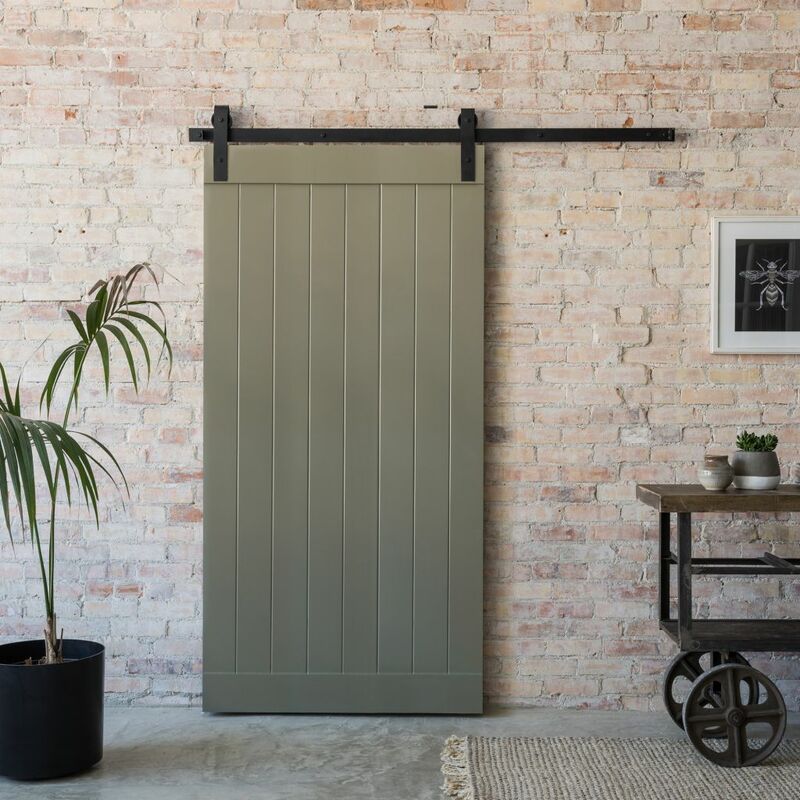 Where regular swinging, bi-fold or French doors need ample space to function, our Barn Doors simply slide alongside your walls. It’s true that the adjacent walls need to be free of obstructions – a characteristic that the cavity slider doesn’t need. However, Barn Door installations are much quicker and easier for the less experienced DIY-er. Our range uses the Frontier Barn Door sliding system and is paired with a variety of internal and entrance products. The Frontier Barn Door sliding system is the basis of our Barn Doors range. It can hold a single door, which does a great job of hiding your laundry or linen cupboard or the Frontier Ultimate double door option keeps this classical appeal but shows it off in a big way. The system gives you the option of keeping a room private and secluded when closed, or fresh and grand when open. A soft colour with a hint of exposed timber beneath makes for the perfect lounge room feature. If double doors are too wide or bold for you, the Frontier Ultimate single door option might do the trick! It’s more rustic than traditional and alludes to the promise of a warm, cozy nook behind it. It’s perfect for a small bedroom or reading corner. You may be familiar with the Hampton Internal range and the cool, coastal relaxation vibes it promises. By using the Hampton in conjunction with the Barn Door sliding system, it adds style to any room and invites those looking to unwind. We’ve found this product, as a single, is perfect for guest rooms or spare bedrooms. As a double set, it makes a fun addition to kids rooms or play rooms – a bright pop of colour usually suits this kind of atmosphere too. As its name suggest, the internal Premium range features top-of-the-line design and beautiful modern stylings. This door has the potential to be a quite addition to a homey space, or the bold feature in any room, depending on how you choose to use it. A soft colour coat makes for the perfect closet doors, while a pop of colour can brighten and personalise a teen/young adult’s bedroom. Where most of the products in this range aim to be bold and give off a wow-factor, the Primecoat doors offer a softer, less obvious option. Paint it a similar colour as your wall and it doesn’t have to take over the whole room. It works great between high traffic rooms, as it can stay open and not look out of place. This door comes with the option of glass inserts. It’s sure to transform any room from run-of-the-mill to a sophisticated, chic space. This particular door is very similar to its entryway sister, the Linear Entrance, in its broadness. It’s great for creating a grand entrance to a special-occasion/entertainment room and is very popular for wine cellars and tasting rooms. Who could forget our grand entryway Savoy 1200 range? It’s rustic, grand and customisable and can be stained or left raw, depending on how classic you want it to look. You can also pick and choose from the glass insert options to really make it your own. We’ve found any room that utilised exposed timber pairs perfectly with this door, be it a master bedroom or a dining room. We’re sure you’ve heard of our joinery products, be it either the internal or the entrance product line. Both ranges feature doors that are chic and modern, and the Joinery Barn Door is no different. Akin to its sister ranges, this door is primarily glass. It’s perfect for an on-trend loft or apartment that wants to keep the illusion of space, while remaining private. Which is your favourite? Be sure to check out all the Hume products on our website, or give us a call to learn more! « Door jargon – what do these commonly used terms mean?